Taking a road trip in the 1920s– when the Victoria Resort Bed and Breakfast was built– was a different experience than what we have now. For context, think about the fact that there were around 8,000 registered vehicles in 1900, but nearly 23 million by 1930. Vehicles and many roads were new, and the travel infrastructure on which most of us rely was in the process of being manufactured. Guest accommodations, including cabin camps, were popping up along highways and in tourist destinations. These cabins were often small, fulfilling travelers’ basic housing needs. Though it’s a far cry from basic, and has been thoroughly renovated to meet the needs of today’s traveler, the experience which the Victoria Resort offers is a reminder of what it might have felt like to travel in the 1920s and 1930s. Put briefly, it’s a world of difference from staying at a hotel. Lodging here was one of the highlights of my #MittenTrip to South Haven, and I hope to share a piece of that experience with you. 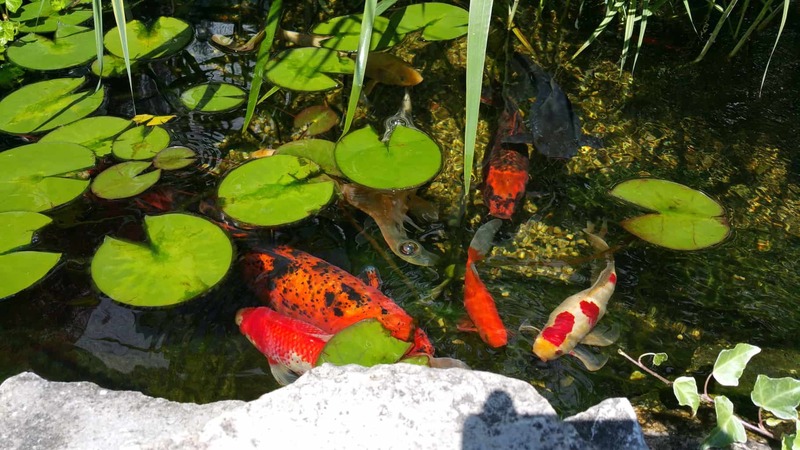 Koi Pond at Victoria Resort Bed & Breakfast. Photo by Shannon Saksewski. It’s rare to meet the person who owns and operates any of the lodging facilities which I visit in a year, which made my visit at the Victoria Resort that much more notable. It was a pleasure to meet, and spend some time with with, Jan Leksich. In 1989, Jan Leksich and her husband left Chicago for a new life in South Haven. 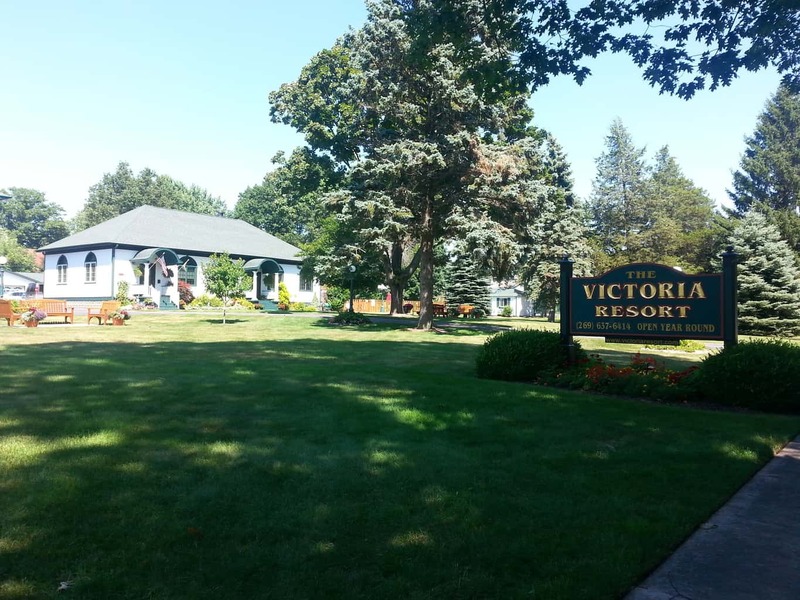 They’d purchased the Victoria Resort, which was in need of considerable rehabilitation. Twenty-six years later, their decades of hard work are evident in the immaculate lawns, quaint buildings, and numerous guests returning year-after-year. 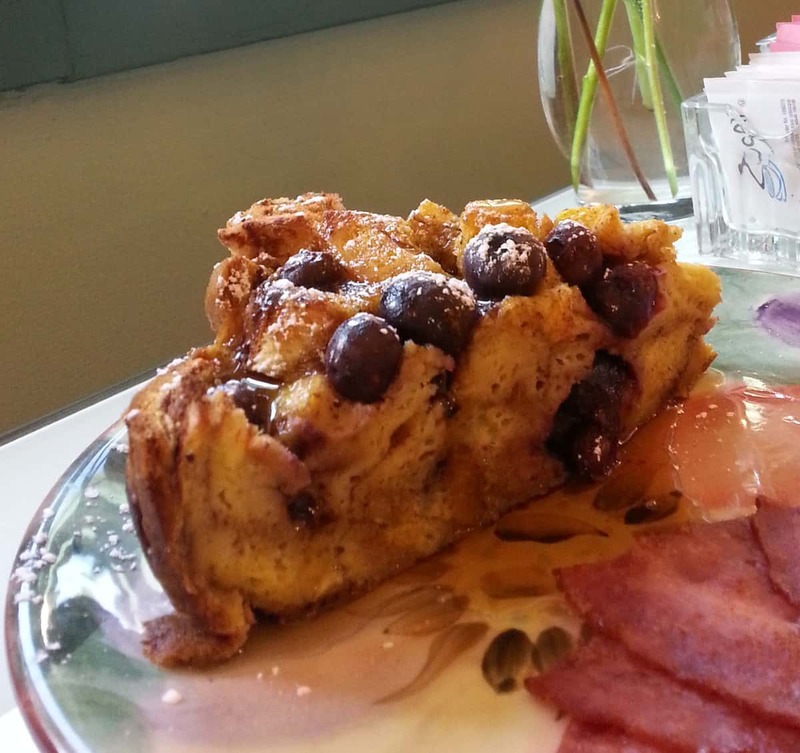 Breakfast at Victoria Resort Bed and Breakfast – blueberry baked french toast. Photo by Shannon Saksewski. It’s not a hotel. You won’t find a cookie-cutter experience here. The Resort offers both B&B rooms, as well as private cabins. The rooms come with breakfast in the dining room adjacent to the office, many offer both fireplaces and huge whirlpool tubs. The cabins offer a full kitchen, multiple bedrooms, a living area, porches, and picnic tables. They’re fully-stocked houses, each with a different set-up and personality. It’s a block from the beach. Really! At the end of Oak St., on which the Victoria Resort is located, you’ll find Oak Street Beach. It’s small, sure, but it’s just about perfect if what you want to do is swim in Lake Michigan and/or hang out in your beach chair. Amenities everywhere! In addition to the fact that the property itself is beautiful, and the beach is a very short walk away, there’s much more! There’s a pool with a lovely deck, grills and picnic tables, a fire pit, bikes to borrow, tennis courts, a playground for the kids, and more. Plus, for those who are able, downtown shops and restaurants are a 20 minute walk away. Otherwise, free parking lots are available throughout downtown South Haven. A balance of privacy and community. It’s a challenge to strike a balance between feelings of peaceful separation and togetherness, but the Victoria Resort has figured it out. There are plenty of friendly faces and community areas if you want to invite folks to hang out. However, it’s also completely reasonable and feasible to enjoy your privacy. As an introvert who thoroughly enjoys quiet and privacy, I often have concerns about staying at B&Bs. Those concerns were completely unfounded during my stay at the Victoria Resort– it was wonderful. We stayed at the lovely Victoria Resort Bed & Breakfast. Photo by Shannon Saksewski. As I mentioned in my #MittenTrip Guide to South Haven, I’m kicking myself for having never visited this lovely beach town until now. The hospitality, amenities, and relaxation offered by the Victoria Resort played no small part in my resolve to return. What are your favorite places to stay when you’re on a road trip? What towns and natural areas do you like to visit? Tagged beaches, bed and breakfast, mittentrip, South Haven, Southwest Michigan, victoria resort, Weekend Trip.